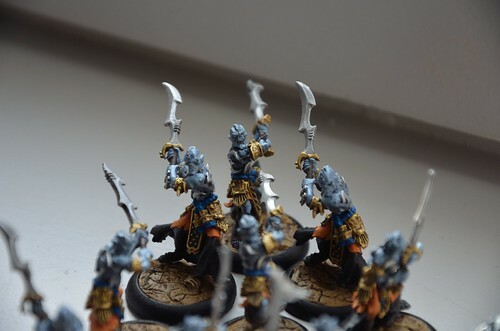 Last Sunday I had my 2nd event playing Skorne. The event took place at L’Imaginarium – Namur. Which on it’s own is pretty special. 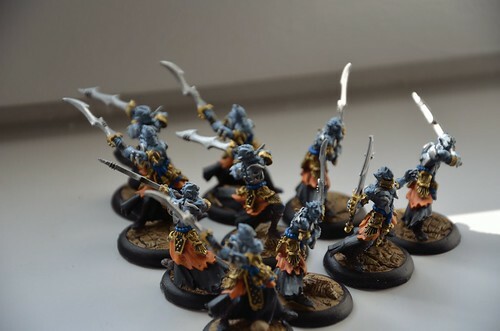 In Belgium until recently warmachine 50 point events were hosted in Flanders and Wallonia was “uncharted territory” with regards to steam roller events. When I saw the announcement for the 50 points event, I decided it was time to travel south and see how the warmachine / hordes community was doing. One of the important elements of organizing and attending events is that the pg’s / organizers know each other and try to motivate players to travel to other venues, and taking the first steps towards this is always a fun experience. Turns out I made a good call in visiting our friends in Namur, what I found there was a fun community in a very cozy shop. In total 4 players from Flanders were attending and even 2 from France, aside from the local players and there were 10 participants in total. My results sadly don’t represent my play at all. I’m at the point where I’m starting to see the possibilities and the plays I should see, but I’m not fluent and automated enough to keep the clock in check. The final result was 0/3 win/loss. The first 2 games I faced Menoth, the 3rd one was against Cygnar. I played my Xerxis Fist of Halaak in all 3 games. All 3 games went ok; I made good tactical calls and was up on attrition (and scenario in some cases). The first 2 games I got death clocked, decision making is still taking more time than it should. The 3rd game, a full Tiberion was wrecked by eHailey with melee attacks; I sure wasn’t expecting my zone holder to be reduced to nothing with such ease. This was ofc related to some pretty shiny dice rolls and well dice happen, sometimes for you, sometimes for the other player. Best moment of the day was when the Gladiator and Tibbers managed to destroy the Avatar, a Reckoner and a Crusader one after another (Xerxis feat, fury and enrage may have been involved 😀 ). Now that my game play seems to be falling into place, the next step will be timer training. Or as Wout pointed out “maybe you should pick that book on time management”, which was pretty spot on 😀 . I would like to thank the guys from L’Imaginarium because we had a great time, and met some awesome people. I really wanted to get to know the meta “down south” and I’m happy I took the time to do so. I hope we can get players to travel both North and South and make this newer meta part of the Belgian tournament scene. 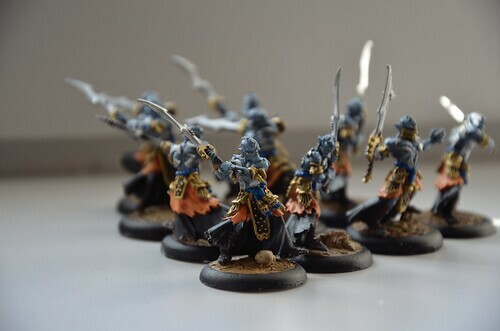 I also appreciated people walking up to me saying “I read your blog” and “I like how your army looks”. 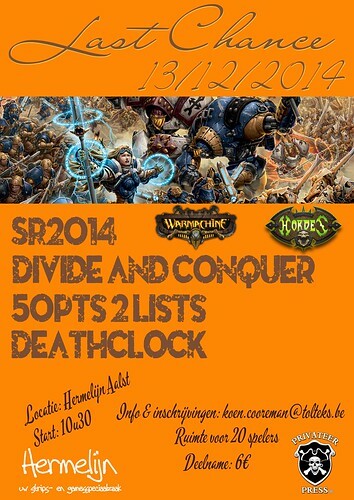 Next month (13/12/2014) there’s a Steam roller event in Aalst, as local PG I’ll be hosting not playing, however I always have fun regardless, I hope to see familiar faces from all around the country as usual. 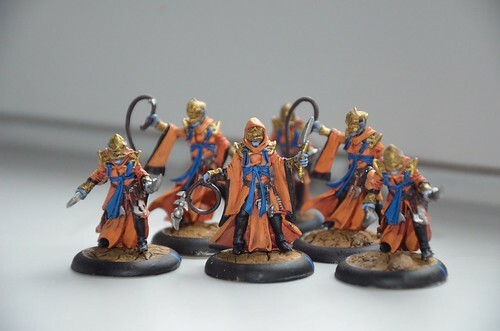 The beast handlers are done, well they have been for more than a week now, I just had a pretty busy week so I didn’t have much blog time. Next up will be the Cetrati. I have to say, painting a non armor clad unit does change things up. 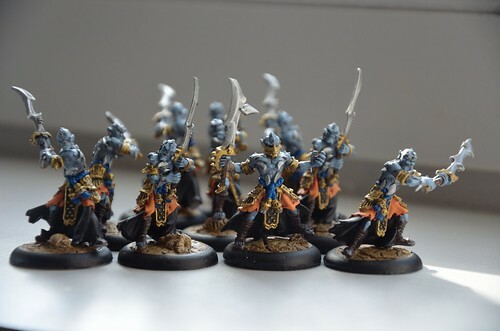 I like the look of the medium based infantry and I prefer them on the table over units such as Nihilators, however for painting it’s a nice change of pace. 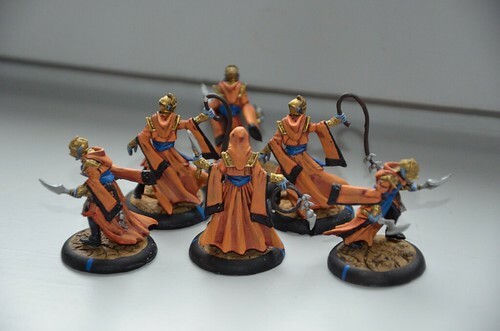 It’s also way faster to paint these up compared to the med based units.